Seeing a triple digit number, like 111, or 222 might be a coincidence, but if they are happening all throughout your day, it might be time to pause and ask why. 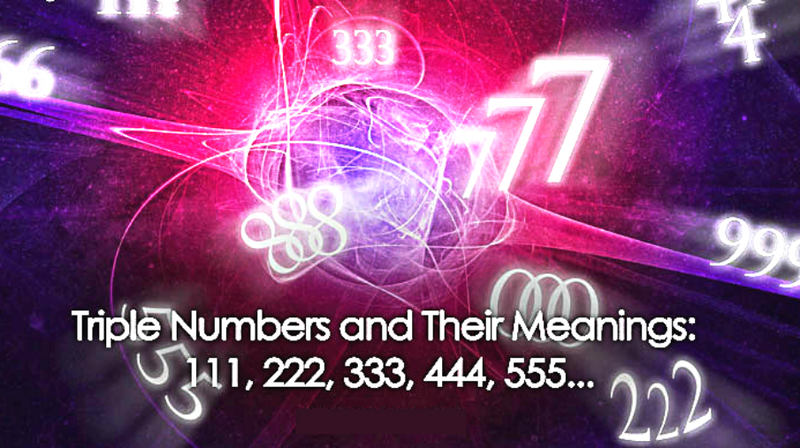 Numbers are 2 dimensional geometry and geometry is the language of The Universe we live in. Consciousness is a part of that Universal Intelligence and sometimes it tries to send us a message. If you are going through life-changing situations, it means you are being shaken up, while good shifts in your world signifies you are being on the right track. No matter the cause, we all need higher guidance sometimes, and being able to understand its language is a must to get the message. These experiences and messages bring us back into alignment with our authentic selves. This process includes transmuting and cleansing old beliefs, judgments, grudges, anger, fear, doubt, and all things that hold us back from stepping into our Truth. When we are awakened to the truth of who we are, we start seeing symbols and numbers that hold messages in themselves. So, when you see repeating numbers, it’s not a coincidence. If that’s where your attention goes attracted like a magnet, to see these numbers, than you are being given a message. An energetic gateway is being opened for you that allows your thoughts to manifest in reality. Pay close attention to your thoughts and make sure they are what you desire. Avoid feeding your fears with energy, or else you manifest them. Seeing this triple digit means you are encouraged to have faith and that everything will turn out to be alright. You need not to worry about anything because this situation resolves rightfully including the people involved. You have successfully merged with the ascended masters who work with you day in and day out in different levels. They are loving, guiding, and protecting you all the time. This triple number holds a beautiful message that you are being surrounded, loved, and supported by thousands of angels at this moment. Your connection with the angelic realm is so strong and clear. It further tells you that you are an Earth angel yourself, who has nothing to fear because everything is well. This triple number tells you that you are undergoing major changes and important transformations in life. You are given the opportunity to break out of the chrysalis, which leads you to the path that you truly deserve. 666 – Bringing balance and healing to your life. Bring balance and healing into your life by redirecting your focus on the Spirit. This is the best time to offer all your fears to heaven, especially in matters of material supply. Be receptive to the help and love from humans and Angels. 777 – Reaping the rewards. Because you have listened well to your Divine Guidance, you are now reaping the fruitful rewards of your labor. You are a big help as well as an inspiration to others. Continue your good deeds and spread inspiration more. 888 – Enjoying financial prosperity. The Universe is showering you with abundance and generosity because you have learned how to step into the shower of its ever-present flow. You are given great financial prosperity this time and the years to come. 999 – Embarking into your Divine life purpose. You are a Lightworker destined to bring into fruition your Divine life purpose at the very moment. You are called to answer your Divine call and sacred mission without delay or hesitation. As you allow your journey to unfold daily, you may receive varying number combinations that serve as your guide to your Highest self. Don’t ignore them and be always aware. The messages they bring are important to your transformation.